We’re super excited to announce that Decipher has been shortlisted in the “Supplier of the Year (Technology)” category in the LegalWeek British Legal Awards 2018. 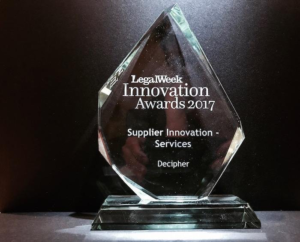 Recruitment due diligence provider Decipher was awarded the supplier innovation for services title in recognition of its lateral hire investigations offering, which provides comprehensive background vetting of lawyers anywhere in the world within 10 days at a low fixed cost. Decipher was praised for its lateral hire investigations offering, which provides comprehensive background investigations of lawyers anywhere in the world within 10 days at a fixed cost. “A much-needed service in today’s climate of high-stakes, often unsuccessful lateral hiring,” one judge noted. The panel of judges included Jeremy Barton, general counsel of KPMG U.K., a noted thought leader and consultant; Chris Bull, a well-respected legal management consultant; Tony Williams, an experienced law firm adviser; and a host of other respected executives, consultants and journalists within the legal industry.